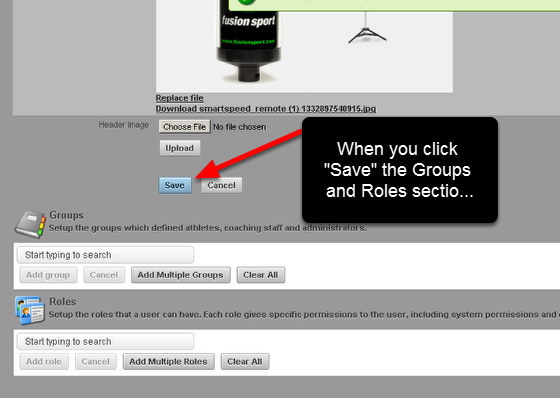 Once you create a new Page Layout and you click on "Save", the Groups and Roles sections appear below the Save button. The Page Layout you have created can now be applied to a Group/s or a Role/s. The Page Layout that you have created during the previous lessons can now be applied to Group/s and/or to a Role/s. When you add in Group and/or a Role to the Groups and Roles sections of a Page Layout, then each User that is in the Group (or they are a coach of the group) or in the Role that you have applied this Page Layout to will see this Page Layout. It appears when they view the group, or when they login. See the steps below to find out more about applying a Page Layout to a Group/Groups. Once you have read this lesson, then review the lesson on applying a Page layout to a Role. It is critical that you understand the Page Layout display hierarchy before you start adding Page Layouts to different Roles and Groups. Alternatively, you can click on the specific Page Layout from the Page Layout List to open it and then access the Groups and Roles sections. To apply a Page Layout to a Group add in a Group/s in the Groups Section. You can add a single group at a time or select to add multiple and choose the Groups. You can apply a Page Layout to a Group. The athletes in that group and the coaches of that group will have that Page Layout. If the Group is a Parent group and it has Subgroups, when you load the Parent group or any subgroups of the Parent Group, the Page Layout applied to the Parent will show for the Parent Group and All of the Subgroups (unless the subgroup has been assigned it's own Page Layout, see the steps below to find out more). If you are a coach with access to this Group, when you save this group on your Groups Modules you will see the U18 Page Layout. 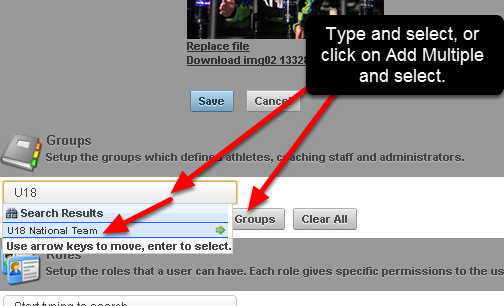 If you are an athlete in this group, then you will automatically have access to this Page Layout. Once you add in a Group (as show in the previous step), it is always best practice to click on the Group you have assigned the Page Layout to and check all of the User that will now have this layout. When you open the U18 National Team Group, you can see that the U18 National Team Page Layout now appears in this Group's details. Open up the Group and double check that you want the coaches and the athletes of this group to have this Page Layout. Once a Group is added to the Page Layout (e.g. the U18 Page Layout), any athletes in that group will be shown this layout. If they only have access to some of the Modules (buttons, small links and tabs), only the Modules that they access to will appear. This is the view when an athlete who is the U18 Group logins in. You can see it is split into sections. The athlete only has access to the modules that they have permission to see. Once a Group is added to a Page layout (e.g the U18 Page Layout), any Professionals that access that group will be shown that Page Layout ONLY when they load that specific Group of athletes or a Subgroup of that Group. The example here shows a Coach viewing the U18 Group. This is the view the coach of the U18 team would see when looking at the data for the U18 National Team. However, if the coach changed to another group (as shown in the image in the step below), the Page Layout will revert back to the main theme because the new Group does not have a Page Layout, and it is not a subgroup of a group with a Page Layout. 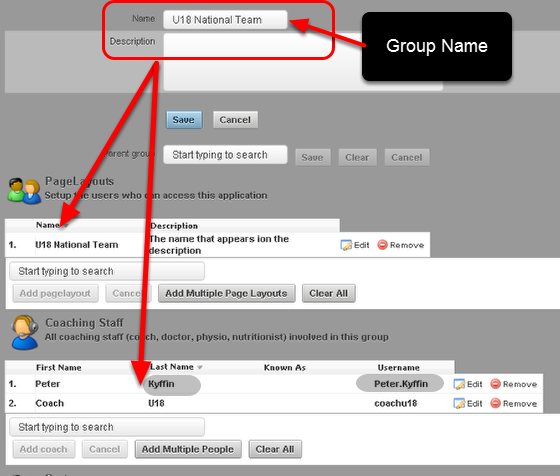 When the coach changes Groups to a Group with no Page Layout, the site will just show the main theme for the site (as shown in the image in the step below). The coach is changing the view to the U20 National Theme. This Group is NOT a subgroup and it does not have a theme assigned to it yet. If the Coach changes to a different group without a Custom Page Layout (as in the step in the image above), then the main site theme will show. What happens if you have created multiple Page Layouts and one Page layout is applied to the Parent group and a different Page Layout is applied to a Subgroup? The image here shows that a new Page Layout was created for the National Squad. The U20 National Team and the U18 National Team have been added as subgroups of the National Squad Group. This means the Page Layout applied to the National Squad will automatically be applied to ALL subgroups in the National Squad Group (e.g. the U18 and the U20 National Teams). However, if a subgroup has it's own Page Layout applied to it, then the Subgroup will display the Page Layout assigned to that specific group as a priority over the Parent Group Page Layout. Because the U18 National Team already has a Page Layout assigned to it, this will continue to be displayed. The U20 National Team Group will display the National Squad Page Layout. The image in the step below highlights this work flow. The image in this step highlights how a Page Layout applied to a Parent Group is automatically applied to any Subgroups. However, if a Subgroup has it's own Page Layout, this will display. All of these examples are displayed below. When the coach loads the National Squad Group, he/she will see the National Squad Page layout. We choose a red header and strange image here to highlight the changes between Page Layouts. This image shows the National Team Page Layout. This Page Layout theme is the same as the theme is the step above. When the coach loads the U18 National Team, he/she will see the U18 National Team Page Layout. Because the U18 National Team has it's own Page Layout, this is shows when you view the U18 National Team. Now you need to learn what Happens if a Coach is in a Role with a Page Layout assigned to that Role, AND they are viewing a Group with a Page Layout or a Subgroup with a Page Layout. This is reviewed in the next lesson. N.B If an athlete is in multiple Groups and they have a different Page Layout Assigned to each of the Groups they are in, the system will just select a Page Layout randomly. If the athlete in the U18 group was added as an athlete into the National Squad (not just as an athlete in a subgroup of the National Squad, but as an actual athlete in this group) then the system would randomly assign a Page Layout. The image here shows the Page Layout for the National Squad appears when the U18 player logins in. Even though the player is in 2 groups with different page layouts for each, the system has to choose one and it will assign only one of them.